Daughter of Captain Joseph Catez and Marie Catez. Her father died when the girl was seven, leaving her mother to raise Elizabeth and her sister Marguerite. Noted as a lively, popular girl, extremely stubborn, given to fits of rage, with great reverence for God, and an early attraction to a life of prayer and reflection. Gifted pianist. She visited the sick and taught catechism to children. Much against her mother's wishes, she entered the Discalced Carmelite monastery in Dijon, France on 2 August 1901. Though noted for great spiritual growth, she was also plagued with periods of powerful darkness, and her spiritual director expressed doubts over Elizabeth's vocation. She completed her noviate, and took her final vows on 11 January 1903. She became a spiritual director for many, and left a legacy of letters and retreat guides. Her dying words: I am going to Light, to Love, to Life! Son of a wealthy farmer. Friar Minor at Dumfries where his uncle Elias Duns was superior. Studied at Oxford and Paris. Ordained 17 March 1291 at Saint Andrew's Church, Northampton at age 25. Lectured at Oxford and Cambridge from 1297 to 1301 when he returned to Paris to teach and complete his doctorate. John pointed out the richness of the Augustinian-Franciscan tradition, appreciated the wisdom of Saint Thomas Aquinas, Aristotle and the Muslim philosophers, and still managed to be an independent thinker. His ideas led to the founding of a school of Scholastic thought called Scotism. 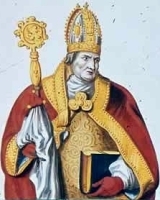 In 1303 when King Philip the Fair tried to enlist the University of Paris on his side in a dispute with Pope Boniface VIII over the taxation of Church property, but John dissented and was given three days to leave France. He returned to Paris in 1305, and received his doctorate. He then taught there, and in 1307 so ably defended the Immaculate Conception of Mary that the university officially adopted his position. Drawing on this work, Pope Pius IX solemnly defined the Immaculate Conception of Mary in 1854. 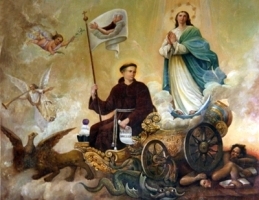 The Franciscan minister general assigned John to the Franciscan school in Cologne, Germany; he died there the next year. Son of Frodon, a solid citizen in a small town. Raised from age 5 in the Benedictine abbey of Mont-Saint-Quentin where his godfather was abbot Godefroid, and where he immediately donned a Benedictine habit and lived as a tiny monk. He became a Benedictine monk when he came of age. 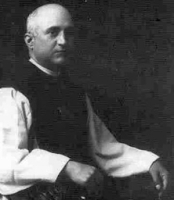 Priest, ordained by bishop Radbod II of Noyon, France. Abbot of Nogent-sous-Coucy, archdiocese of Rheims, Champagne province (in modern France) in 1096. When he arrived, the place was overrun by weeds and housed only six nuns and two children. He rebuilt, restored, and revitalized the abbey, bringing people to the Order, and Order to the people. Offered the abbacy of Saint-Remi, but refused. Offered the archbishopric of Rheims in 1097, but refused, claiming he was unworthy. Offered the bishopric of Amiens, France in 1104, and still considered himself unworthy of the trust; King Philip and the Council of Troyes each ordered him to take it, and so he did. Noted for his rigid austerity - with himself, those around him, and in his approach to his mission as bishop. Enforced clerical celibacy. Fierce lifelong opponent of drunkeness and simony, which led to an attempt on his life. For most of his time as bishop, he wished to resign and retire as a Carthusian monk. In 1114 he moved to a monastery, but a few months later his people demanded his return, and he agreed. Took part in the Council of Chálons. Though popular in life and death, his name did not appear on the calendars until the 16th century. Daughter of Piero Satellico and Lucia Mander, she grew up in the home of her maternal uncle who was a priest. Weak and sickly as a child, she was strong in prayer, music and singing. "I want to become a nun," she said, "and if I succeed, I want to become a saint". Student in the Poor Clare Monastery of Ostra Vetere, and responsible for singing and playing the organ. Joined the Poor Clares at age 19, she made her religious profession on 19 May 1726, taking the name Maria Crucified. Abbess of her community. Educated at York, England. Benedictine monk. Priest. Friend of Blessed Alcuin. Evangelist throughout western Europe. Worked in Frisia in 766, preaching in Dokkum, Overyssel, Humsterland, and Utrecht, but was driven out by violent pagans. Sent by Charlemagne to evangelize the Saxons in 780, but was expelled in 782 following a revolt by King Widukind against Charlemagne's rule. Pilgrim to Rome, Italy. Copied manuscripts at the abbey of Echternach. Following Charlemagne's re-conquest of the Saxons, Willehad became bishop of Bremen in 787, a seat he held until his death. Built the cathedral there, and many churches throughout his see. Son of Stephen, a subdeacon. Pope. Supported the clergy who were being repressed by the politics of the day, trying to work their vocations during rebellions in Ravenna and Naples in Italy. Worked among victims of leprosy and an earthquake in his diocese. Said to have been the first to use bullae or lead seals for pontifical documents; hence the term Papal Bull. Many old Benedictine documents describe him as a Benedictine monk, but there is no outside evidence of it, and Deusdedit was known for his support of and dependance on the secular clergy. May have been the son of Saint Selevan; may have been the cousin of Saint David of Wales. Itinerent hermit, evangelist, monk and abbot. Found of the monastery of Caer Gybi (Cybi's Fort) at Holyhead, Anglesey, Wales, located within the walls of an ancient Roman fort, and is still venerated there. Missionary bishop to the area around the monastery. Friend of Saint Seiriol. Many exaggerated stories grew up around him. 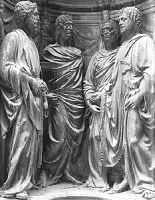 Saint Castorus, Saint Claudius, Saint Nicostratus, and Saint Simpronian. Skilled stone carvers in the 3rd century quarries. Martyred when they refused to carve an idol of Aesculapius for Diocletian. Hermit at Kenedor and Holyman Head in Scotland, where he lived in a cave. He would light torches at night to warn ships away from the dangerous rocks along the shore. His cave survived into the 19th century, being a place of pilgrimage before being quarried out. Legend says that once when he needed wood to complete construction of a church, a great storm struck upriver of him, washing enough timber down river to finish the work. Priest in the Diocese of Madrid, Spain. Member of the Order of Saint Jerome, restorer. Martyred in the Spanish Civil War. Born to the Welsh royalty, the son of prince Brochwel Ysgythrog. Monk, and then abbot in Meifod, Montgomeryshire, Wales. The nearby town of Llandysilio, Wales is named for him. He founded several churches throughout Wales. May have moved to Brittany, but records are unclear. Priest in the apostolic vicariate of West Tonkin (in modern Vietnam). Martyred in the persecutions of Emperor Thieu Tri. While on pilgrimage to Rome, Italy he became a Benedictine monk, receiving the cowl on the Caelian Hill. In 949, on his way back to England he stopped at the abbey of Einsiedeln, Switzerland, and stayed to join the community. Abbot during the abbey's period of greatest growth and fame. Priest in the apostolic vicariate of West Tonkin. Member of the Society of Foreign Missions of Paris. Martyr. Wealthy citizen of Tours, France; he gave up his wealth and position to become a monk at Marmoutier Abbey in Tours. Spiritual student of Saint Martin of Tours. Friend of Saint Sulpicius Severus and Saint Paulinus of Nola. Priest. Lived his later years as a hermit near the abbey. Benedictine monk at Saint Maximinus at Trèves (modern Trier, Germany) Abbot of the monastery of Mettlach, Germany. Bishop of Trèves c.770. Part of the court of Charlemagne. Abbot at Dunkeld, Scotland. Bishop of Dunblane, Scotland. Several churches are named for him, and he was venerated with a solemn office in the old Scottish rite. Bishop of Verdun, Gaul (in modern France) from 353 to 383. A regional memorial of all the saints and beati of the calendar who have a connection to the Diocese of Evry-Corbeil-Essonnes, France.